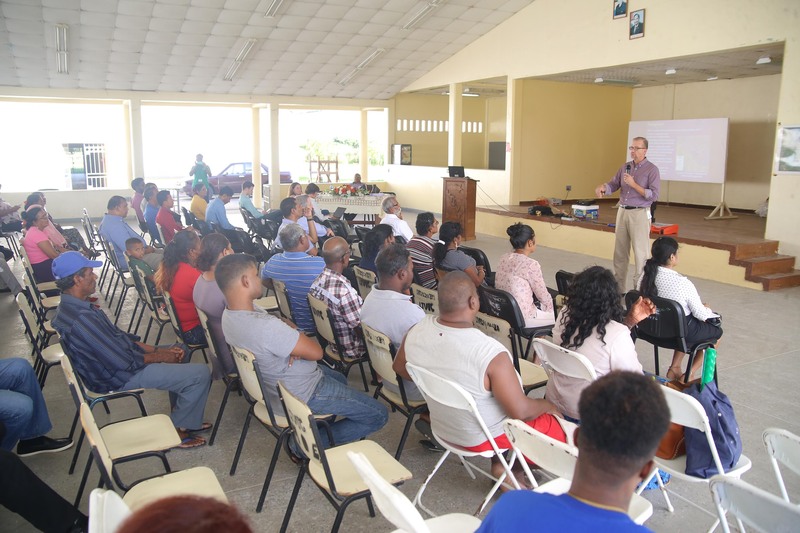 ExxonMobil’s Operations Manager Doug McGhee discusses the Liza Phase 2 development with residents of Region Three at a session held at the Leonora Technical Institute. 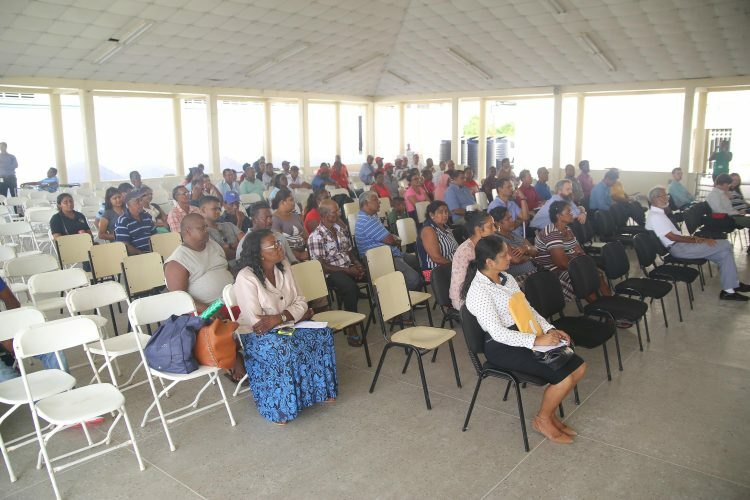 A potential oil spill and the effects on the environment remained among the main concerns raised when the Environmental Protection Agency (EPA) continued its ongoing public scoping meetings on the oil company’s Liza Phase 2 Development Project in Region Three last Friday. 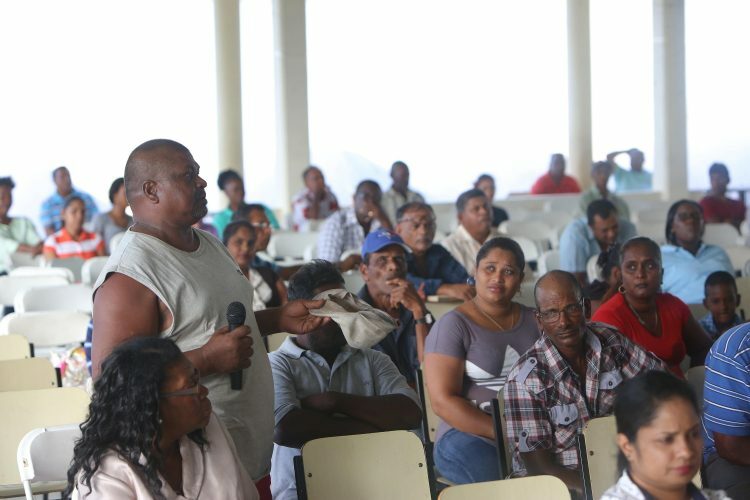 “In the event of an oil spill, what guarantees we have that the consequences of it will not affect the environment and fisher folk badly?” resident Jay Narine, who is a fisherman, asked EPA and ExxonMobil officials at the public scoping meeting that was held at the Leonora Technical Institute, on the West Coast of Demerara. “I am a fisherman and I have six children. I may not be here later on when oil start really but an oil spill can impact heavily on fish and that is we way of life. We catch gilbaka here and it already depleting… so, what will you do so that this don’t impact heavily on fish?” John Benchman, another fisherman, added. Science teacher Alfred Bhulai poses a question. A fisherman asks questions about the impact of the operations on marine life and local fisher folk. Concerns over the potential effects of a spill have been voiced at previous scoping meetings. 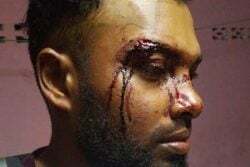 Narine noted that Guyanese are a suspicious people and don’t believe what the politicians say and as a result he said there was much trepidation over promises that there was a small chance of an oil spill and that it would be handled before reaching the shore should one occur. 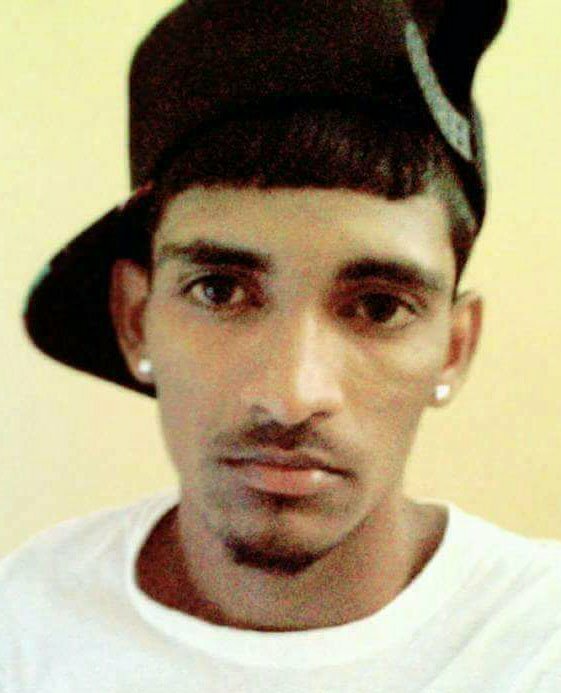 Benchman told of his experience after gold mining company Omai caused a cyanide spill, which flowed from the Omai River into the main Essequibo River in 1995. He said that it had severely affected residents in surrounding communities and fishermen. 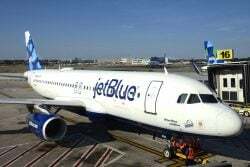 He added that the company never expected a spill and was not prepared for the disaster, which is why he was worried about his and his children’s futures. Taking up on Benchman’s point was science teacher and Region Three resident Alfred Bhulai, who said that at the time of the Omai spill the EPA was not open about the project and never took the concerns that were raised seriously. As a result, he urged that the agency be more open and vigilant now to ensure there is no repeat of a disaster. Bhulai also had pressing questions of his own. He said with a projected 4,000 to 5,000 tonnes of hazardous waste expected to be produced annually from the project, he wanted to know where it would be stored or disposed of and if this country’s water system was at risk of contamination. He also asked how often the EPA plans to go out to inspect the offshore project so as to assess if environmental protection measures were being met and if it had the capacity for such inspections. While women were present among the approximately 50 attendees at the meeting, only the men asked questions. Some wanted to know about if the deep sea drilling would have an effect on waves and possibly cause flooding, especially in the Essequibo islands. “When you start drill, will it create big waves? Can the drilling and work undersea from this project give us earth tremors? In your contract, is there any money put aside for things like this? We already know we get a raw deal but want to know now that since we are below sea level, will the waves affect us and how will we be compensated?” Sheik Ayube asked. 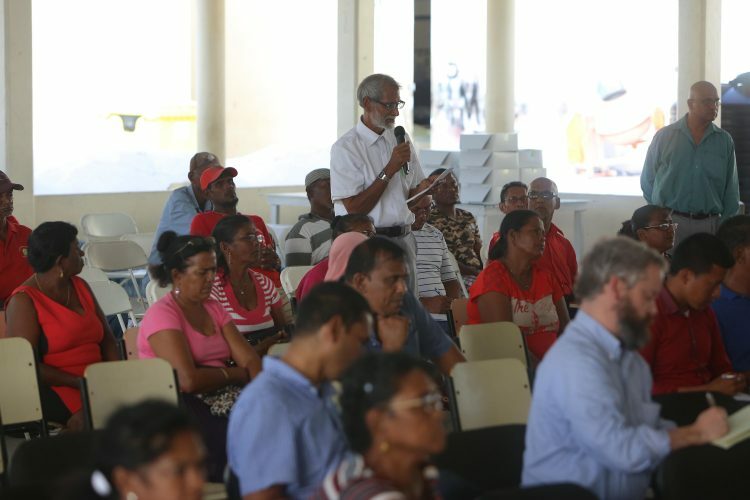 The EPA’s representative, Senior Environment Officer Candace Thompson, explained to residents that as part of the regulatory process, Exxon subsidiary Esso Exploration and Production Guyana Ltd. (EEPGL) submitted an application to the agency for environment authorisation for its potential production concept for the Liza Phase 2 project, which is also in the Stabroek Block and about 8.5 kilometers east of the Liza Phase 1 project. That concept, she said, says it is similar to the Liza Phase 1 but that it would be larger as it involves a second and larger floating production storage and offloading (FPSO) vessel and related subsea equipment. Thompson explained that the agency was seeking views from across the country to develop a terms of reference which would guide an Environmental Impact Assessment (EIA) for the project. There is a 28-day period where persons can also write or email their concerns to EPA. However, the agency decided to go across the country and meet with persons to inform them more about the project and get them to assist the EPA in understanding what they believe would be some of the impacts. Questions and concerns raised from Friday’s session, Thompson said, would be added to others from the countrywide outreach when the EPA prepares its EIA terms of reference. A summary of the project was discussed by ExxonMobil’s Operations Manager Doug McGhee. He said that it is anticipated that within the project area, approximately 35 to 45 wells may be drilled at two subsea drill centres, at about 1,600 to 1,850 meters of water depth. However, all the wells drilled will not be producers and oil will only be sourced from about 16 to 19. These subsea facilities include various types of equipment, pipelines and hardware. The subsea facilities allow the oil from the wells to be gathered and moved to the surface of the ocean for further processing by the FPSO. The FPSO planned to be used at Liza Phase 2 will be a dedicated one as there will be no sharing between the facilities and it has the capacity of storing about 1.6 million barrels of oil. Projected to start production in 2022, once all necessary requirements are met, Liza Phase 2 will see an estimated production capacity of approximately 190,000 to 220,000 barrels of oil per day, McGhee informed. The Production Manager’s explanation of the project was well received but feedback from persons showed that many were still unaware of the overall operations of even the current Liza Phase 1 and what are ExxonMobil’s obligations under its contract with the government. Questions were raised about monies to be received by individual citizens, free cooking gas, unions for workers in the industry and oil spill training for residents. “I want to know when we will be able to collect the cheque from the oil because I hear that everybody will be given a cheque… also there is something about free gas. When will we get free cooking gas?” a male resident asked. Another said that he believes that there should be training of small boat operators so that in the event of a spill they could start the clean up before Exxon’s experts from overseas arrive. EPA and ExxonMobil officials said that they want the public to know that the public scoping meetings are only one way of getting public input as both entities can be reached for further clarity on social media and through emails. A full summary of the project can also be had by visiting the EPA’s website at http://www.epaguyana.org/index.php/downloads/esso.